So, we didn’t get the new Optimus G2 at CES as had been rumored a number of times. 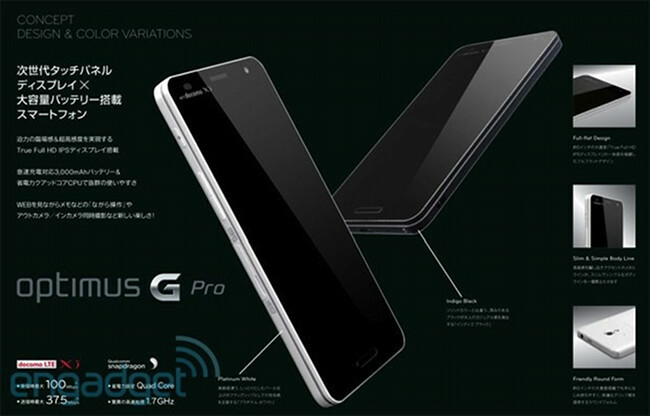 But that may be because the device will actually be called the Optimus G Pro and may arrive a bit later at MWC for all to drool over. According to a leaked slide, the device above is that device, one that will sport a 5″ 1080p display (the standard these days), a beefed up 1.7GHz Snapdragon S4 Pro, 32GB of internal storage, LTE, and a massive 3000mAh battery. The phone will be just 10mm thick, have a 13MP rear camera, and a 2.4MP front shooter. Sound enticing? It’s like LG’s version of the One X and One X+. We won’t complain, we just wish it would have arrived at CES so we could have put our slippery little grubbers all over it. We were big fans of the original Optimus G (our review), so we can’t imagine this won’t get us hot and tingly as well.